Feeding a Horseshoe Crab - 03/31/07 Hello guys! <<Good morning!>> I love your site, thanks in advance for the help here. <<Hope it proves useful>> I recently purchased a horseshoe crab for my tank. <<Mmm...and likely Limulus polyphemus...an Atlantic species>> I have fine sand, fairly deep (3-4 inches), a lot of room for him (75 gallons with little live rock), but I am worried about feeding him. <<75g is not enough room for a mature L. polyphemus...can grow to 12" in diameter>> I read that you are supposed to feed him blood worms/clams/mollusks. <<You can, yes...and a clam "is" a mollusk...as are mussels, oysters, snails, octopi, etc.>> I have blood worms, but I don't understand exactly how him to eat them. Should I bury them in the sand so when he runs over them he munches them? <<I wouldn't>> Then I am worried that my cleaner shrimp would find it first. I have also heard about sticking it under his shell. Do I just grab him by the sides and put the food underneath him? <<Though quite hardy, I wouldn't advise subjecting it to this stressful activity on a continuing basis>> Also where can I buy mollusks? I'm not really sure what they look like. <<Oh but you do! (see here: http://www.google.com/search?sourceid=navclient&aq=t&ie=UTF-8&rls=WZPA,WZPA:2007-07,WZPA:en&q=mollusks+definition) Go to your local grocer and pick up some fresh clams/oysters/mussels from the seafood section. 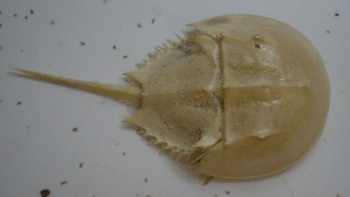 place one of these on the substrate near the horseshoe crab...you can even help it out a bit if you wish by prying the shell open beforehand but this shouldn't be necessary...and as an occasional treat you can also present it with worms/Nightcrawlers from the garden. And do be sure to remove any uneaten foodstuffs>> Thanks! Horseshoe crabs 10/5/05 I was reading on your FAQ's about horseshoe crabs that they don't live long ..days or weeks. I had kept them before in a tank without a heater (room temp), and they lasted for years. I fed them black worms, and I would put a little piece of fish under their shell. The tank was fairly warm, but most of them did ok. <Eddie, the general rule for keeping horseshoe crabs is a larger system with fine gravel/sand and preferably cool water. As you say, they are not hard to keep provided the correct conditions are provided. 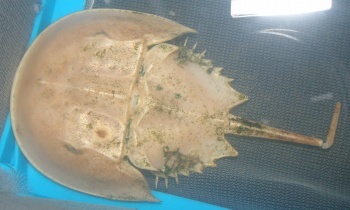 James (Salty Dog)> Eddie V.
Horseshoe Crabs Bob, Thank you for responding to my last couple of e-mails. Your advice is greatly appreciated! I just added 5 horseshoe crabs in my 100 g. tank to help stir the substrate. Three of them disappeared into the sand as I thought they would but there a couple that keep flopping around and swimming in circles. They start to go under the sand and then they come right back out. Sometimes they end up on their back. They will turn themselves over after a while. It is tiring to watch...I feel like I need to help them out. It's like they don't know what they are doing. Is this normal? <Yes... normal... they even do this in the wild! Hard to understand how they've made it all these eons...> Will they eventually get under the sand? <Maybe... some stay on top... others perish. Bob Fenner> Thanks so much for taking the time. Cathy M.